It exists! 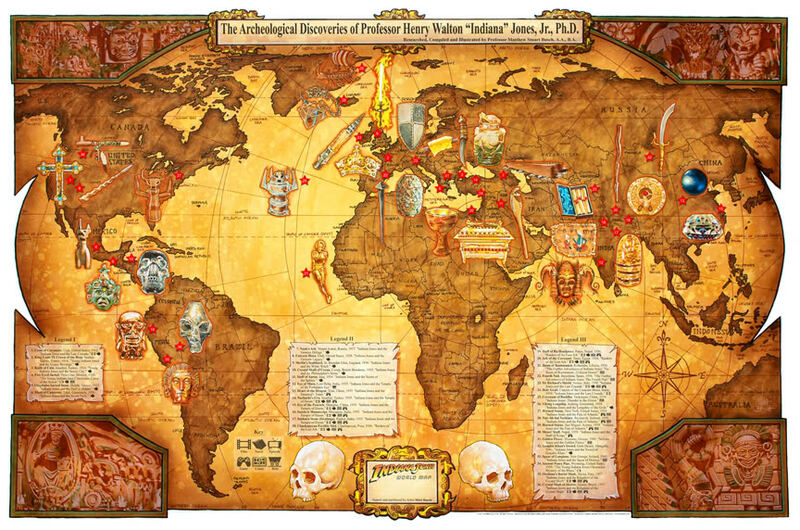 And it includes all the places where the famous archaeologist made his discoveries. There are 36 different archeological artifacts displayed, each illustrated where Indy discovered it, and numbered chronologically. 3 Legend sections list info on the artifacts, including name, city and country, year, title of the story the artifact was discovered in, followed by symbols. I find this map appealing because it makes me go back to all the movies of Mr. Jones and in a way I see them again, right before my eyes. Now this is a paper item I would love to see on eCharta. It has the perfect profile and I know at least a bunch of people who would care to buy it. The 1904 Summer Olympics, officially known as the Games of the III Olympiad, was an international multi-sport event which was celebrated in St. Louis, Missouri, in the United States from July 1 to November 23, 1904, at what is now known as Francis Field on the campus of Washington University in St. Louis. St. Louis organizers repeated the mistakes made at the 1900 Summer Olympics organized in Paris. Competitions were compacted to a side-show of the World’s Fair and were lost in the chaos of other, more popular cultural exhibits. Officially, the games lasted for four and a half months; in fact, James Edward Sullivan tried to hold an event every day for the duration of the fair. The Olympic events were again mixed with other side sporting events, but Sullivan called all his sports events “Olympic.” The IOC later declared that only 94 of these events were Olympic Games. The participants totaled 651 athletes – 645 men and 6 women representing 12 countries. However, only 42 events (less than half) actually included athletes who were not from the United States. The marathon was the most bizarre event of the Games. It was run in inhumanly hot weather, over dirty roads, with horses and automobiles clearing the way and creating dust clouds. 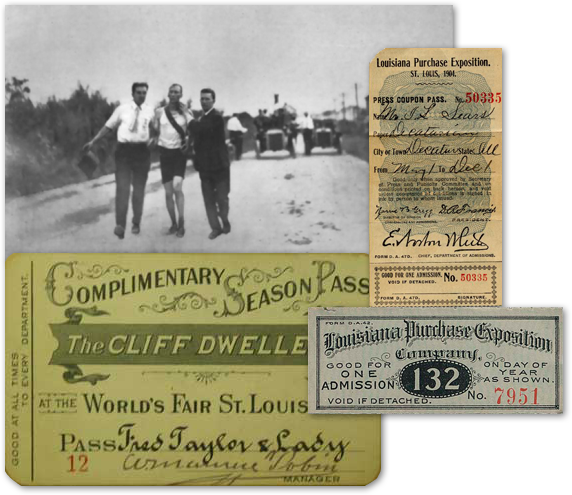 A Thomas Hicks photo, a season pass, a regular ticket and a press pass show the paper treasures of this era! The first to arrive at the finish line was Frederick Lorz, who actually rode part of the distance in a car (! ).Frederick started the race with the rest of the athletes but not long after the 9th mile he dropped out. In order to retrieve his clothes, he rode on a car and headed to the finish line. But fate plays strange games sometimes and the car broke down on the 19th mile! Having no other choice he re-entered the race and jogged to the finish line and was announced winner of the Marathon. While on that day he was awarded the gold medal, his celebration did not last long as the scheme was unveiled and he was banned for a year by the AAU. Next year, Frederick Lorz came back and won the 1905 Boston Marathon, for real this time. For US Thomas Hicks (a Briton running for the United States) was the first to cross the finish-line legally, after having received several doses of strychnine sulfate (a common rat poison, which arouses the nervous system in small doses) mixed with brandy from his trainers. No anti-doping control back then! He was supported by his trainers when he crossed the finish, but is still considered the winner. Hicks had to be carried off the track immediately after the run. He was so exhausted that possibly would have died in the stadium. But treated by several doctors he came back next year. The Worlds Fair was scheduled to open in late 1903, which would have been the 100th anniversary of the Louisiana Purchase. However because of the preparations for the Olympic games the fair opening was delayed. Stamps issued before and during the 3rd Olympics in St. Louis. 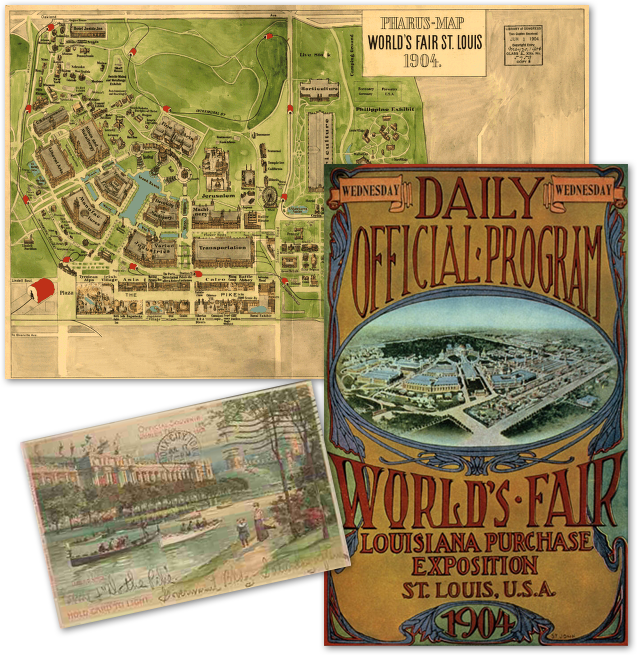 Before and during the expo and the Games were issued The Louisiana Purchase Exposition Stamps. The First Day of issue for this series of Postage was April 30, 1904. They were issued to promote the exposition. On the stamps was depicted: Robert Livingston, who served as a delegate of New York and as a delegate to the Constitution Convention. Engraved image of Livingston is taken from a Gilbert Stuart (1783-1872) oil painting of 179. President Thomas Jefferson on 2c Issue. He was the architect of the Louisiana. James Monroe 3c Issue. This issue marked the first appearance of James Monroe on US Postage. Louisiana Purchase Map 10c Issue. This issue depicts an engraved map of the United States, showing the territory of the Louisiana Purchase in darker color, with the year of the purchase, “1803”, inscribed across the face of this area. 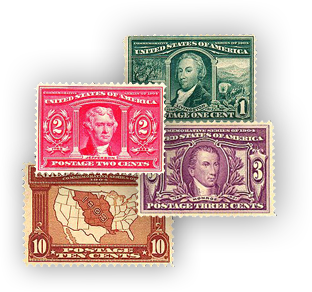 The Bureau of Engraving and Printing printed only 4,011,200 of these issues and consequently surviving examples have been scarce, making it the most valuable stamp of this series to this day. 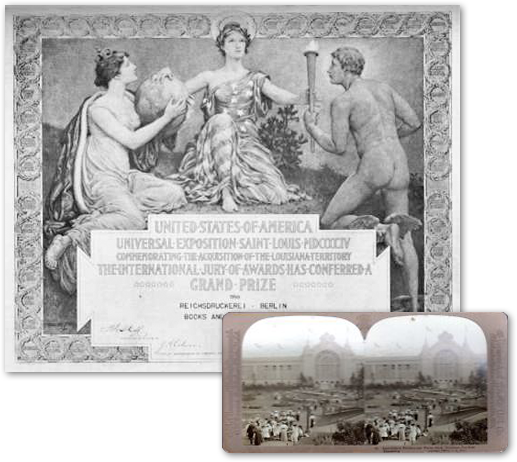 A stereo-view card along with the Olympics Award! As today November 23, 1904 3rd Olympic games Closing ceremony in St. Louis took place! The Olympics is an event that attracts a lot of people. To watch, to participate voluntarily, to share the athletes sorrow or joy, to …collect. Paper material form all Modern Olympics since 1986 are collected frantically!